The Seer team keeps a running doc of Google search features and oddities, which we collectively update any time we spot something new. This allows us to identify trends in what features Google is testing and to provide our partners with up-to-date information about their SERP landscapes. We also monitor specific features to see how they have changed over time, and what affect that has on search results. November was full of updates. For the first time, we’ve recapped some of the highlights in the video below. Check it out then read on about what these new features could mean for you and your site. One Seer team member was searching for lightweight electronic keyboards when, after bouncing quickly from the search results, landed at the SERP shown below. This spin-off of the People Also Ask or PAA has been evolving since as early as 2015 as highlighted in this article. However, this development by Google incorporates the Searches Related feature usually seen at the bottom of the SERP page. What does this mean? This gives the user a second chance to refine their search. The first search a swing and a miss, but even before you step up to the plate for the second search, Google is there to suggest what you might have been looking for in the first place. For our client, the keywords shown in this feature can give insights into potential valuable keywords that may have been overlooked. If there are gaps between these highly relevant search terms and keywords included for the page, then implementation represents a quick win to improve the optimization of your page. 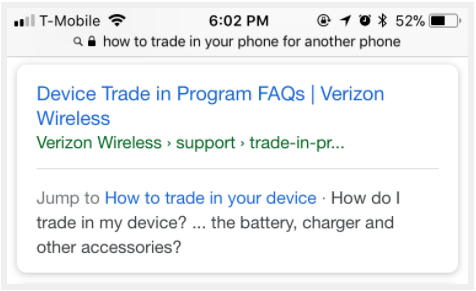 When searching how to exchange her phone for another, Emily found that Google had detected a jump link on a page and displayed a schema-like link in the search results. Here we see this feature in full display on both web and mobile, giving Emily the ability to jump to the part of the page that contains that specific bit of text. What does this mean? Time back in Emily’s pocket as she’s immediately directed to the exact information she was looking for through the jump link. And more certainty in her mind that the SERP is going to contain the answer she is looking for before she even clicks on it. For your website, this could help decrease bounce rate while increasing CTR. This feature is also pulling on-page header copy for the SERP jump link, so it’s essential to have headers that truly engage with customer questions and intent. When searching for information about data breaches a colleague came across a SERP for the Rand Study at a URL under Dark Reading’s domain. The meta description said that no information was available and prompted her to learn why, revealing that somehow the owner of the site had “blocked this page from Google in a suboptimal way”. What does this mean? This is an update of an old feature. Google now shows a more concise “No information is available for this page” instead of the “This page is blocked by robots.txt”. Maybe you as a site owner are too picky about the pages that Google is crawling and it’s time to get a little less paranoid. If you are the owner of a URL that contains one of these messages in place of an optimized meta description your CTR is suffering and your content is losing out to competitors. Do the Amish get autism? Those searching for proof of anti-vaccination claims are now able to get their answers even faster thanks to this new feature from Google. Launched back in October of 2016, fact checking websites like Snopes.com and PolitiFact, and publishers that are “algorithmically determined to be an authoritative source of information” will be eligible to display the tags. For the full look into this feature that Google is still testing read this article from Search Engine Watch. What does this mean? For publishers and outlets that claim to be truthful this could be a dangerous game to play, but most sites will not be eligible as an “authoritative source of information.” For the sites that are eligible however, we expect greater CTR inequality for the SERP, where the CTR of the featured result will be much higher than all others. Mobile Pages on Desktop Results? We clicked through but the mobile version rendered horribly on the desktop. Still, in the SERPs it showed higher than the desktop version for both devices. What does this mean? Following Google’s mobile index update, they are clearly preferring mobile to desktop despite the user experience. We were able to replicate this result but we can expect Google to eventually iron this out. The underlying takeaway though: this reinforces the importance of mobile SEO as the industry moves forward. John Lewis represents three things. One, Georgia’s 5th Congressional District as its US House Representative. Two, Civil Rights activists who have dedicated their lives to their constituents and neighbors. And three, a challenge for the John Lewis department store’s SEO goals. But this new Google Search Box feature that we first looked into in July eliminates confusion before you have even clicked through to the results page. 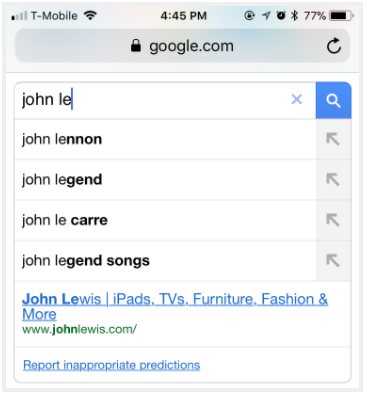 After typing in “John Le”, Google tried to predict our searches but also delineated between the two different John Lewis’s. It appears this feature is only available for desktop as the mobile version tries to take the user directly to John Lewis the department store. Taking our process one step further this month- when we finished the search for John Lewis without selecting either funneled result, the highest SERP was the department store John Lewis but the Knowledge Graph was the US Representative and Civil Rights Hero. What does this mean? Google is allowing multiple sites to rank for the same Knowledge Graphs for the same keywords depending on the user intent. As Google updates this feature we will continue to monitor it and stay on top of what it could mean for our clients. Professional liability insurance in California is not a quick and easy topic- and Google doesn’t seem to think so either. That may be why Google allowed these instances of a non-truncated, 230+ character meta descriptions in the SERP seen here below. Note that this was for desktop only. We originally thought that this was an oddity but it seems that Google has been testing this feature, and as of December 1st, is officially increasing the length of snippets in search results. What does this mean? In this case the meta description seems to actually just be pulling copy from the body of the page itself. It is Google choosing the content it thinks is most relevant for the user to see in that position. As Google has been testing this feature, the average length has been 230 characters. This means that clients could have the opportunity for additional real estate on the SERP page without structured data if Google makes a habit of doing this. Meta descriptions don’t affect ranking currently, however they do have an impact on CTR, making this a potentially highly valuable update for our clients. Considering a new phone? There’s the Google Pixel 2 and the Apple iPhone X. You’ve heard good things about each but you want to compare so you pull open a tab for each on your current phone and search to get the specs. 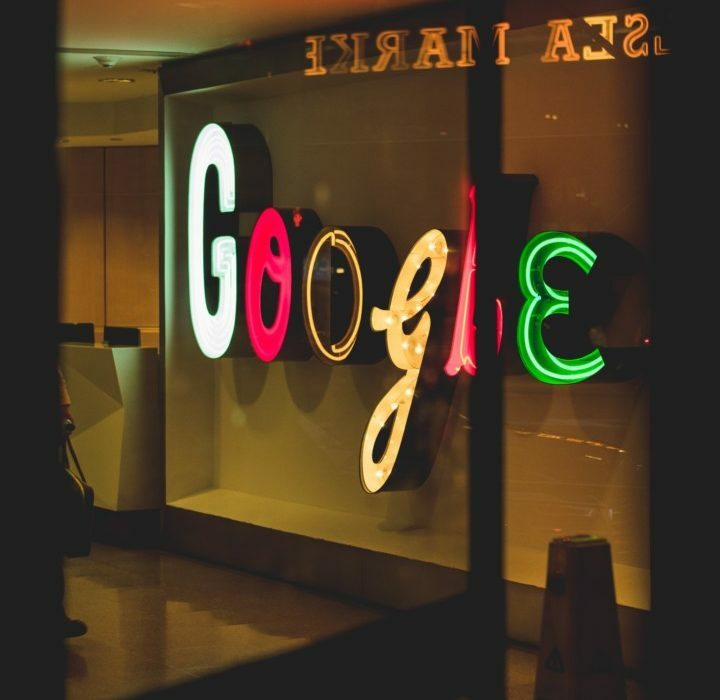 Since 2013 Google has offered the feature to compare two things via knowledge graph on desktop, but the big news is that this is the first time the feature is being offered on mobile. This was reported for the first time that we saw just earlier in November. 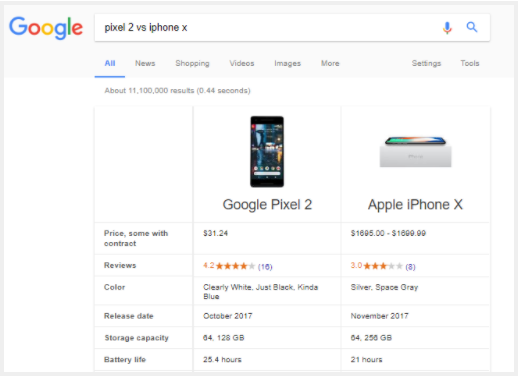 Before this feature was introduced on mobile, if you searched something along the lines of “Google Pixel 2 vs Apple iPhone X” you might have gotten a blog or a similarly subjective comparison of the two from a third party source. But this new Google knowledge graph shows product statistics side by side. Whether you are on a desktop or your smartphone, this feature is now available. Take a look at Sarah’s previous post about the history here. What does this mean? No more flipping back and forth between tabs. The research phase of the customer journey is significantly reduced and before you have even clicked through a search result you have comparisons on storage and battery life, color lists and security features, and links to reviews from other customers- all on your phone. Mobile-first indexing is coming, and with it surely will added new search features like this one.